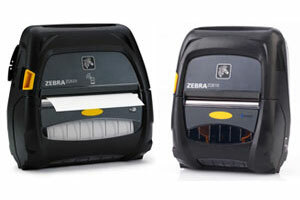 The Zebra ZQ510 and ZQ520 Mobile Printers are the industry’s most compact, rugged printer with a military-grade design coupled with the latest connectivity options and user friendly interface to keep your mobile workers operating in the most challenging of environments. The Zebra ZQ500 series printers can be used in a wide variety of industries including Transportation, Manufacturing, Retail, Hospitality and even features a model that can print RFID tags out in the field. 3" Mobile Printer, Linered Platen, 203 dpi, 5 Ips, Bluetooth 4.0, Direct Thermal, No Battery. 3" Mobile Printer, Linered Platen, 203 dpi, 5 Ips, Bluetooth 4.0, Direct Thermal, 2450 mAh Battery. 3" Mobile Printer, Linered Platen, 203 dpi, 5 Ips, Bluetooth 3.0, Wi-Fi, Active NFC, Direct Thermal, No Battery. 3" Mobile Printer, Linered Platen, 203 dpi, 5 Ips, Bluetooth 3.0, Wi-Fi, Active NFC, Direct Thermal, 2450 mAh Battery. 4" Mobile Printer, Linered Platen, 203 dpi, 5 Ips, Bluetooth 4.0, Direct Thermal, No Battery. 4" Mobile Printer, Linered Platen, 203 dpi, 5 Ips, Bluetooth 4.0, Direct Thermal, 2450 mAh Battery. 4" Mobile Printer, Linered Platen, 203 dpi, 5 Ips, Bluetooth 3.0, Wi-Fi, Active NFC, Direct Thermal, No Battery. 4" Mobile Printer, Linered Platen, 203 dpi, 5 Ips, Bluetooth 3.0, Wi-Fi, Active NFC, Direct Thermal, 2450 mAh Battery. 4" Mobile Printer, Linerless Platen, 203 dpi, 5 Ips, Bluetooth 3.0, Wi-Fi, Active NFC, Direct Thermal, 2450 mAh Battery. 4" UHF RFID Printer, Linered Platen, 203 dpi, 5 Ips, Bluetooth 3.0, Wi-Fi, Direct Thermal, 2450 mAh Battery.